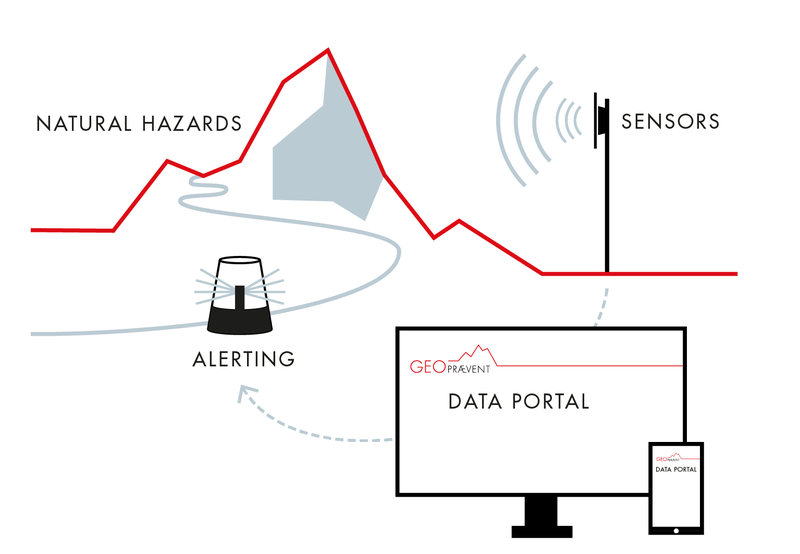 Geopraevent’s sensors detect a variety of natural hazards, algorithms process the data, results are displayed online. In case of an event alerts are triggered automatically – affected people are informed, roads and railways are closed within seconds. To ensure effective detection and monitoring of natural hazards, we use a wide range of sensors and measuring technologies. The interferometric radar detects smallest movements and acts as early warning system for rock instabilities and permafrost. The avalanche radar detects fast movements and acts as alarm system for avalanches and debris flows in all weather conditions. The radar detects the rock fall in all weather conditions and alerts reliably. The radar is used for rockfall and landslides. Automatic deformation analysis of instabilities in rock and ice based on high-resolution images. A picture is worth a thousand words. Webcams are valuable to assess the hazard zone. Radars, laser measurements and pressure probes provide useful data about the flow. The radar detects people in all weather conditions and during day and night. Alerts are triggered automatically. Motion sensors are used to monitor safety nets. They provide useful data and alert in case of an event. Extensometers and telejointmeters measure clefts with submillimeter precision. Easy and fast installation. Detecting people, vehicles, drones and other moving objects.